Recently I read a blog post where the sewist did a beautiful job on a beautiful dress, but it just didn’t suit her. She blogged it with pics and info and it was what I consider to be a great post. You see, I like a cautionary tale. I am a cautionary tale. My size 4 hipless self does not exist. I am not the pattern envelope girl. I’m always amazed if someone wants me to test their pattern- I am not the willowy swan posing by a fountain. I am the distracted chubby gal about to pass out from sucking in my stomache while my photog’ adjusts his canon to the ‘extra chins filter’. I am the ‘well, we know what it looks like in THAT fabric’ girl. The ‘good try!’ girl. The blogger that people hit the ‘like’ button for because the struggle to find an honest compliment is just too hard that early in the morning without coffee! Sometimes this bums me- I want to be the one that all the fabric stores vie for- the one they promote and advise you to emulate. Ok, the one with the discount. 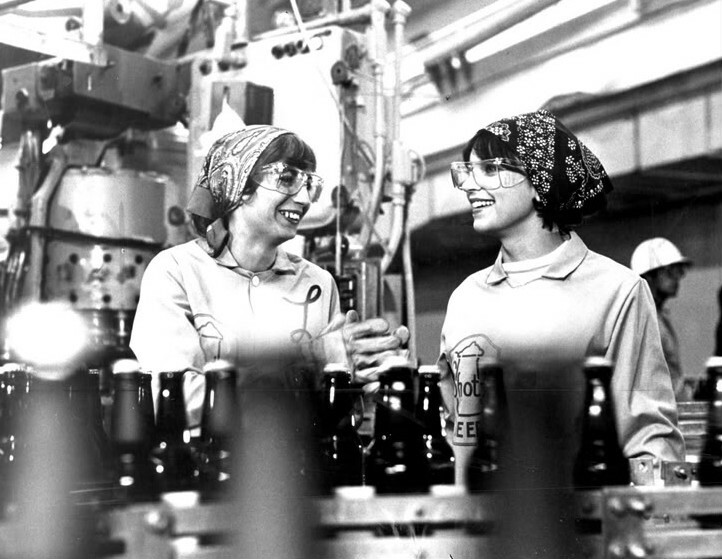 It is really hard to be Laverne in a Shirley world. I was really considering not blogging anymore, thinking that maybe magazines don’t featuring aging debutantes for a reason- no one wants to see that business! But the post I described above really revitalized me. Here was a good sewist showing us her work even if it wouldn’t make it onto Woman’s Wear Daily- it educated, it informed and I thought she did a lovely job. I think she looked lovely. She is lovely. She didn’t blog it for a prize- she loves to sew and it shows. She knows the prize she gets- I forgot it. I forgot why I sew and why I share. 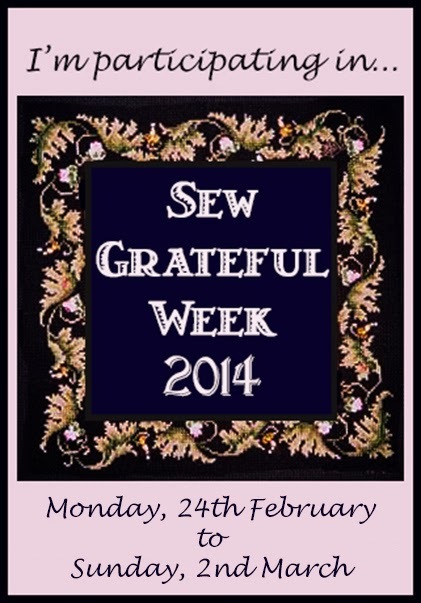 So this week during Sew Grateful Week, I’d like to thank a blogger who inspires me and has a gorgeous wardrobe. Thanks Thornberry– you adorable redhead! So ok, I may never be a network blogger, I’m not to all tastes and I’m not for all audiences, but I’m here and I have a new dress- so get ready! My dress is in honor of the tail end of Blue February! I could have waited for the fictitious Marsupial March, but I want to show this bad, kangaroo Burda off NOW! This is the 2nd Burda I have done that features the mysterious HUNCH DART!!! Yes, the perfect thing for sauntering about your belltower and kicking over gargoyles. A hunchdart. Why? I have no idea why you would want a lozenge shaped horizontal dart across your shoulder blades. Maybe a concealed opening for your wings to emerge from during moments of righteous indignation- like when people say they don’t like to read books- they wait for the movie or when people defend wearing their scrubs in public. Or a quick battery change ala Buzz Lightyear! But just as a thing- just as a design detail? If my back has a dip there so needing of a dart, I think I need more than Burda to help me. But I digress. You knew I would! I did the hunch dart and even duplicated it in the front a bit to keep my symmetry going. This dress was HUGE- boxy is a thing, I love boy, but this was ‘Ma’am- are you smuggling kittens under there? …Or a VW?’ but all these crazy style lines and darty bits made for very easy altering. Now I can only fit kittens in its GINORMOUS front pocket. It is one huge envelope. I lost my phone in here twice. I think if the opening were larger, Bruder and I would attend functions with him in it. A flattering look indeed. I’m very pleased with this- It’s comfortable, work appropriate and has a little retro edge to it. Ok, sometimes I think I might look like a giant over mitt in it, but hey, I hear that is hot in Europe. So did you enjoy Blue February? I’m loving these themes- I don’t wear much blue and it gave me a nice stretch of my interests. I’m not sure how Viking I can get, but, hey- I have married some trolls….. Present company excluded, Sweetie- don’t forget to use that chin filter! photo credist- google images, meadhawg, little me, pattern review.All images remain the property of their original owners. I think that you just made me cry. Thank you SO MUCH for your lovely comments! I’m not asked to be a “network” blogger either but that’s not what it’s all about for me. It’s great to remember the real reasons why I blog and great to think that sharing my efforts is really worthwhile after all. 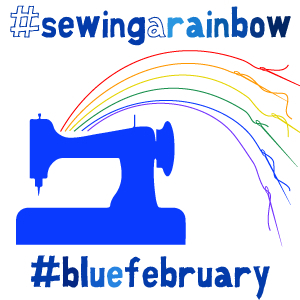 Your contribution to the sewing blogosphere is MASSIVE – please don’t under rate yourself! You are one of my faves. And I love the dress! Oh I love the dress! I too feel like a Laverne in a Shirley world (actually I feel like Laverne’s frumpy older aunt or something). I really appreciate your blog, your style and the way you write. Love the dress and love that color on you! Keep playing with the blues, your complexion looks radiant. One of the things I LOVE about sewing blogs is how they’ve re-educated my fashion eye. Now when I see a fashion shoot in a magazine, I just want to feed those poor dears a nice sandwich. 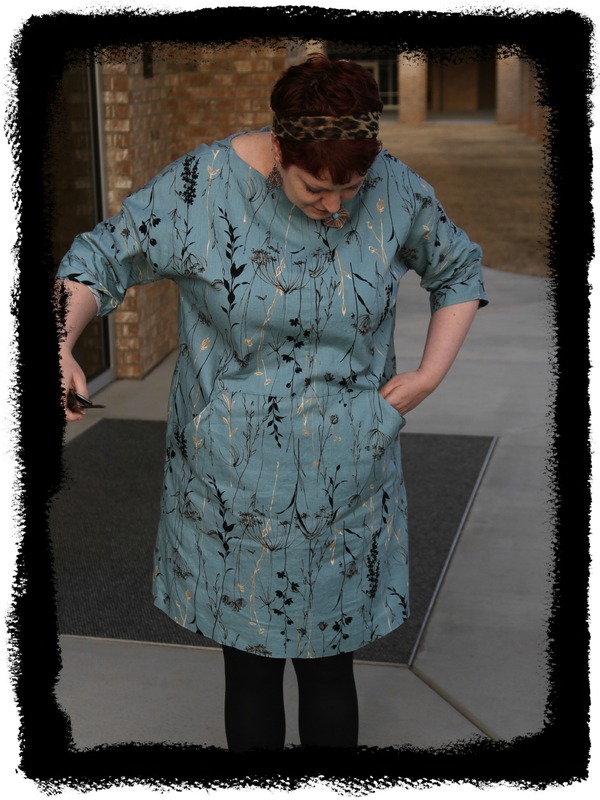 What makes my sewing fingers itch is seeing someone in a garment they made to fit them, in a color they like, worn the way they wear it to go to the grocery store or their kid’s school play I’m always a little sad when I see a blog I enjoy going over to the commercial side. Poster child or not, I think the dress looks great (truly, not in a struggling to think of something nice to say way). The colour is fab, and the silhouette really suits you, wacky back darts aside! I’m glad that not all bloggers are poster children. I’m certainly not, and want to see how people of all ages, shapes, sizes & backgrounds are sewing things up. Oh, no, I’m so sad to think that you even considered not blogging! Your blog is one of my very favorite and I’m always really excited to see a new post from you in my feed (which is why I’m home on a Friday night reading blogs, haha!). I love your fearless approach to sewing- you’re not afraid to try new things and you’re never going to churn out a boring garment. You’re my print icon! OK, as far as blue goes, would you ever wear a bright royal blue? I feel like that would look really good on you, and so would a deep midnight blue. It seems like you often prefer warmer colors, but I bet you would look amazing in them! Here’s to all the Lavernes! That dress is gorgeous and I really enjoy your blog and I also think Thornberry is terrific. You must not entertain such thoughts, blogging or otherwise. 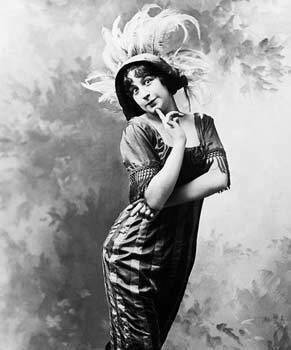 We do not come merely to assess the size of the dress, or the color of your hair. 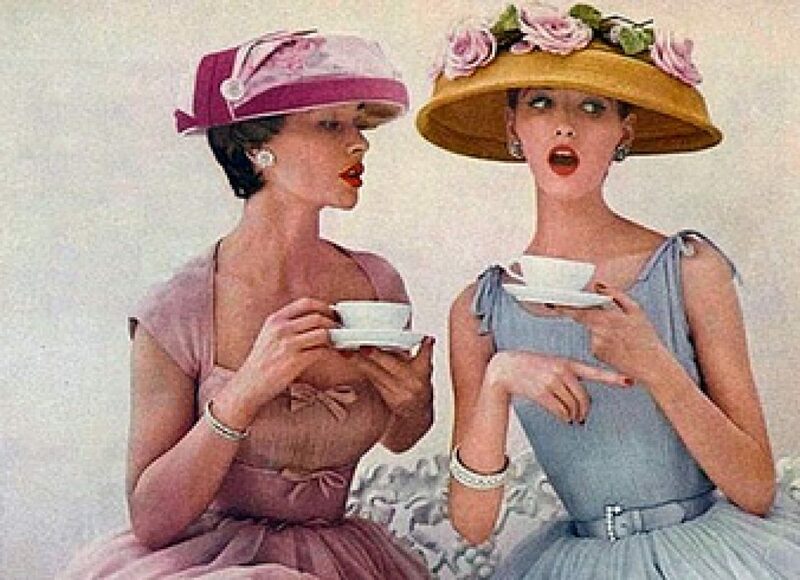 Rather, we come to participate in your delightful wit & enjoy the camaraderie of another beloved sewist. You are my favorite blogger–You’re wit is always entertaining! I don’t have anything approaching a model perfect body either, so I appreciate it when I see sewists who are more like my body type out there. I can relate to your post. I look at all the lovely patterns out there. Then I have to think through the modification I’ll have to make and whether it will look like a mummu on my when I’m done. Just for the record, I really love that dress on you. It looks like it’s in a nice crisp weight cotton with a great color and pattern. And I think it looks great on you. lol – I love how you describe this pattern! And let me just say that, as one of those skinny girls, I doubt I could pull off that look at all! I do not understand the “hunch dart”. It smacks of someone trying too hard. Thank you for being you and not taking yourself too seriously – I always enjoy your posts and your style (even if I don’t always leave a comment)! You better not stop blogging cause I just found you and am loving it! I love this fabric and I think you look very nice in the dress you made. Keep it up! You always make me smile, laugh, and sometimes cry with your wicked humor. Love your dress and yes, you are just lovely in it! Even if your sewing didn’t inspire me (but it does! Someday you’ll drag me out of my cave of solids and into a printed wonderland!) your humor always brightens my day. I would be very sad if you quit blogging–it’s refreshing to see someone who isn’t slim and 18 modeling clothes, and even better if it’s something they’ve made themselves. I’ll confess that I don’t always take the time to comment, but sometimes I feel like a broken record and don’t have anything unique to add to the conversation. So then I don’t say anything at all. Well I like your style and thing you have real attitude. Attitude that I like. I love this blue on you. Actually I love it all. The dress, the fabric and the pattern. I think it’s time to buy a Burda pattern that I might actually sew! You’re always inspiring, witty and an most enjoyable read. The audience is screaming more, more, more. Don’t disappoint us. You are the best blogger. You take the blogging and making seriously but you are intelligent, funny, challenging and it’s far better not to sell out to “the man”. You look like a normal woman, but one with confidence, charm and individuality. Your posts and critiques are very clever and hilarious. And you have cute dogs to boot. Well not to boot, but to help you in your daily tasks. Don’t change a thing. Love Kate. I have that Burda pattern and I’ve been hesitant to sew it up.Largely due to the model in the dress version. She looks like she’s trying to hide some flaw with the way her arms are. Yes, I’m a paranoid sewer. I don’t trust the pattern envelope. But, I do trust you with all your imagined, supposed, real or otherwise ‘flaws’. I like the way it looks on you and therefore I feel emboldened to try it out on me. I dig you Pretty G. Keep blogging! Please, please don’t stop blogging! I have been lurking here for ages and just love your writing and your sewing. Love the dress, it’s a great style on you. Please don’t think about giving up blogging! I always enjoy your posts, you are such a good writer. You are the Queen of Burda – fearless & courageous, loyal and heroic, generous and peerless, you have integrity, humour and humility, and are a true leader of men (sewers)! Maybe uou just had a bad day…. but wearing your new shift dress must have cheered you up and all your postings certainly have that effect on me. The sewing interweb would most definitely be a smaller place without you in it. Anne I was just thinking this morning, when I finished a garment I probably will not blog 😦 that all any of us can be is ourselves and blog for the handful that really enjoy what we offer. You have way more than a handful of fans. Hey lovely … First of all just have to say that your blog was the main one that inspired me to start my sewing blog, and still the one I look forward to the most when it pops up in my blog lovin feed. I love being a Laverne (and a fellow printaholic) and I think the truth is that many women in our situation don’t blog because of this kind of unspoken pressure to be the winsome, popular ingenue. Well, f*** that if you’ll excuse my language, I wasn’t like that in school and I’m not going to start now! 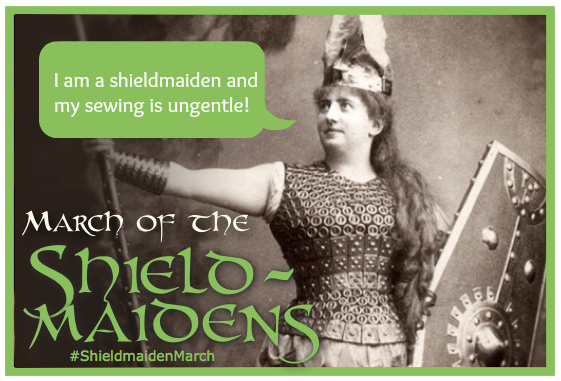 😉 you are a warrior of the sewing world, as is the brilliant Thornberry, both keeping it real and inspirational. P.s. 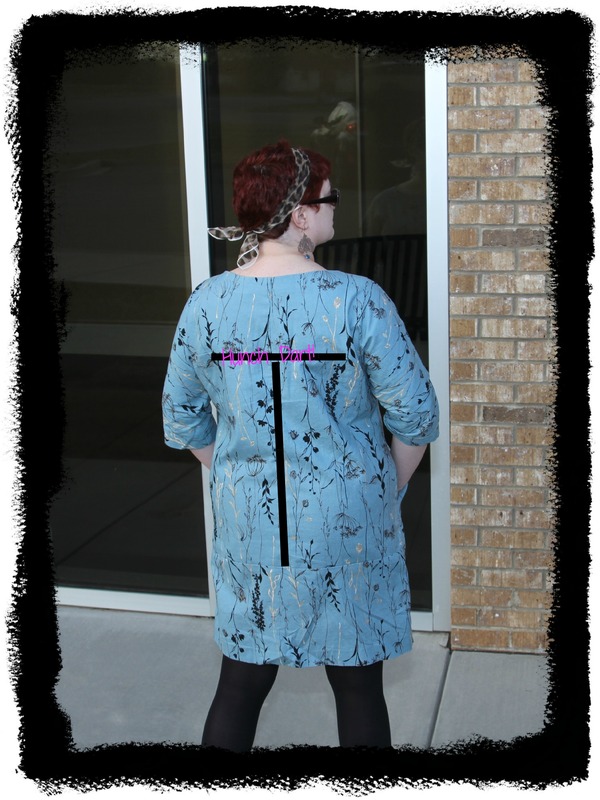 I kinda like the blue shift dress ….. Makes you look like a hipster art teacher! Please don’t stop blogging! You’re one of the wittiest bloggers around and so inspiring. And I too often hit ‘like’ because I have nothing original to say. My goodness those pockets. I’m tempted to run out and get this pattern. Don’t understand the function of the Quasimodo dart but it’s different…too many styles have the two back fisheye darts and it gets a bit dull to my mind. Oh my god, I would be so sad if you stopped blogging – seriously!!! I love what you make – your style is awesome! And you have a unique voice out here in the blogosphere. “I’m here and I have a new dress”- that’s what it all boils down to, isn’t it? Wherever we are, however we look, whatever we sew. I don’t follow your blog because you are a willowy fashion model, or because you have a corporate sponsorship from [insert comglomerate here]. I follow you because you are the Erma Bombeck of sewing writers. You have a rare talent for writing, and I hope you never stop. And for the record, oven mitts are definitely all the rage here…if you ever get to Paris look me up and I’ll show you where all the best/gaudiest fabrics are hidden! “I was really considering not blogging anymore”… My God – you gave me a big scare there. I would have to take to my room with the vapours and perhaps never leave the room again! I am feeling quite faint at the thought. Your dress is lovely. Gorgeous fabric and really looks like a comfortable style. I love your fearless style-and your witty posts! I think it’s so great to see what things look like sewn up on all different body shapes, it makes me rethink patterns that would work-or not- on me. I think this dress is actually really lovely on you- I love the pockets and the color! This Burda pattern was a total fail for me. In fact it is still sitting in a basket somewhere in the twilight zone between redo and wadder. It was the sleeves for me. My god they were low and big and uncomfortable every time I lifted (or tried to) my arms. I do love the pocket construction and while the pattern has gone to the great wood burner out back, the pocket pieces and instructions are tucked away with a pattern they might work for. Your 7203 looks great and I love the blue. Yours is one of my very favorite blogs. I read your blog to follow a down to earth person who makes real clothes for a real body and does it with such humor and wit! I love the blue on you! I think this is a definite win. First of all I really like it and you wrote that it’s comfortable and work appropriate. I’ve been trying to make things I’ll actually wear on a day to day basis and it sounds like you hit the nail on the head with this one. Keep on bloggin’ Anne – we love you just the way you are (queue Billy Joel)! HAA HAA HAA! I would dearly miss your witty writing if you were to stop blogging. Also your print matching is very inspiring to me since my tastes run in the “boring” direction. I like this dress, especially the kangaroo pocket and the pattern happens to be part of my stash. Hmmmmmm. well, you poster child, you look like a pretty fabulous poster. you ooze confidence and warmth and as always the BEST sense of humor, i never would have thought you were having any angst. you are always so true to yourself, which to me is the sexiest thing anyone can be. i think you’re gorgeous, and i absolutely mean it. in fact i refuse to like this post so that you KNOW i mean it. I think you’re being hard on yourself, but aren’t we all from time to time. I LOVE seeing what you make. We definitely have different aesthetics, but I still enjoy seeing your take on a pattern. Aside from your sewing skills, I get a thorough kick out of your sense of humor. I truly think you should get the wittiest stitcher award. Maybe the fabric stores haven’t courted you, but there’s more to sewing and blogging than making clothing they think will sell their fabric. I like the Quasimodo darts. That’s thinking outside the box. I really like this: the neckline, the darts. (did I just say that?) I’m sorry I’m not really a pockets girl. The only garment I feel they’re necessary in is a good coat. I’ll even eschew them in trousers/jeans! I love this. That blue is so pretty. I must have stared at the first pic of you peeking ’round the corner for a good five minutes just taking in the fabric. It’s a great print! And Anne, don’t you DARE stop blogging. Your posts are the most entertaining and sincere sewista posts ever, and I’ll weep buckets if you pull the plug on your witty remarks and collection of prints. It would be a real loss to the blogging world if you didn´t post anything. I find your blogs funny and interesting. Love the Burda dress, too! I have used the horizontal back dart to get rid of excess fabric in the lower back of a jacket. I stitched on a self fabric belt across the back to cover it. It worked great. I found your blog recently and I love it…Wearable Wednesdays are the best! I don’t always comment or “like” (my phone makes it a project…), but I ALWAYS read and enjoy your posts. Your makes look great on you and I often can’t say that about the willowy bloggers out there. For me, it’s all about a beautiful fit- not a numerical body size. Regarding the fabric companies- they must not be aware of the fact you are single-handedly responsible for the spike in animal print sales each year around January. If they have any business savvy, I imagine they’ll start pestering you soon about sponsorship. P.S. The model in the blue dress on the Burda pattern…what’s with her shoes? I agree with another commenter above, you are the wittiest blogger around and I get a big smile on my face when I see a new post from you. Sewing can certainly be a hit or miss process and the satisfaction of creating a winner hopefully outweighs the disappointment of things that don’t work out. This latest dress looks great, fantastic color on you and keep on sewing and blogging, please !!!!!!! Anne, you are one of the first blogs I started following about a year ago, one of the few that inspired me to start my own blog. Not only I am not a poster child myself, I tend to melt into a crowd thinking that my opinion wouldn’t have mattered anyway so why comment. I am trying to break away from that thinking, I tried to say that in my recent post without burdening readers with details. Details are, however, that I spent the last 20 years in jeans and baggy clothing that would put so many layers of fabric around me that it didn’t matter anymore where I stopped and textiles began. I sweat in long pants in the summer because I can’t dare to wear anything that shows my knees. For the last post I took 258 pictures and I could find it in myself to post only a few that I was not absolutely terrified to share (I don’t have the photog’ with the magic filter, lucky you!). You are my inspiration because you are beautiful in everything you make. You are brave to claim your style and share with people like me, silent admirers who secretly envy the confidence you have. I started my blog a month ago and you commented! YOU, the celebrity of the sewing world, came over and took time to support me! If all the replies above mine didn’t convince you that you should keep blogging, mine certainly won’t matter, but if you quit it would be a huge loss in my own personal world that just found a little outlet and where I am trying to gain a little confidence and step away from my oversized gray and black wardrobe. I was thinking that if I find enough support in the blogosphere, I might actually wear what I make in the real world. Don’t abandon me now, in fact maybe we should form Laverne club or something, where one of the requirements would be to leave a comment no matter how insignificant you think your voice is. Nope, we won’t stand for it! Your blog is a must! I’m absolutely awful about commenting because I read posts on my phone and it doesn’t like to cooperate. I think this is a problem for a lot of people. It’s certainly not because I/we don’t enjoy your posts. I absolutely love your wit and true, personal style! This is a great dress and the blue looks wonderful on you! And, to heck with the pattern envelope girl, it looks better on you. Do not stop blogging! You are smart, funny, eccentric, and I love your red pixie! I for one am tired of looking at girls who can look good in anything. You represent real woman with real bodies just like me! I love you and your blog so much! Don’t even consider giving it up! Your a fantastic blogger with an amazing sense of humor and an even better sewist! I love your makes. Love how you have styled the dress. Very smart with the leggings. This is ridic cute and those darts are a fab idea. Though what is this losing of a phone in your pockets? I would suggest smuggling gin! I think you and the garment look smashing! I know where the f¥€k you live. Do NOT stop blogging. Never underrate yourself! You are such a fabulous life force in the blogging community & we wouldn’t let you disappear. I adore your cheeky sense of humour, honesty and forthrightness – I only wish you were kinder to yourself. Sass has no size – and you have it in spades. Sew on you sassy lass. Love that dress and I love your blog! Please stay with us! I don’t usually write many comments – more of a silent blog observer as I tend to read them at 6.30am over breakfast when I am not yet capable of communication. There must be hundreds more like me who love to read and know that we are not alone in the sewing world. Well, the Big 5 pattern companies should take note of you! I have purchased several patterns (that I would never have considered buying) after seeing them made up on your blog. You have a talent for making every outfit look awesome. I am grateful that you take the time and effort to share your sewing adventures. I envy your style and I love your wit. Please don’t stop. I love your blue dress, and I love your blog. Please don’t ever stop sharing your thoughts and makes with such great wit and humour, there are loads of us out here hanging on to every word! Noooooo don’t stop blogging please! I love reading your blog. I love seeing the things you make, mostly because they’re in a style I really like but can’t pull off myself! Wow so much love above, and so deserved. Yours is a blog I get so much enjoyment out of, you are so witty, with a talent for the written word that I envy. You never fail to bring a smile to my face, so please don’t stop blogging. I really like this dress on you, it is kinda funky and artsy looking, and that fabric is gorgeous! Back to your new dress. I love the coloring on you. Goes really well with your hair color. Looks much more iconic than the pattern envelope. So I’m really not sure about your claim to be “no Poster Child for Burda 7203”! Quite frankly the pattern envelope is very forgettable. And glad to read in your latest post that the cloud seems to be dispersing. Stay online. Stay blogging! This has really quite upset me. How could you doubt how much joy your blog has brought other sewists? I love your fearless use of prints, you try interesting patterns and your hilarious commentary on designer collections brightens up my weeks. I’m so pleased you saw the light and kept on blogging. I dream of being as engaging and as successful a blogger as you are. Oh girl! You will never know how much I envy you! I think, at most, only two sewing bloggers have ever visited my blog and if I get more than one comment on any post I almost feel like I’ve won the lottery. Besides envying you for all your wonderful commenters, I love your sense of humor and your taste in fabrics. You encourage me to proudly go for the gaudy. Lady, you have intelligence, wit, and most importantly, you have style. It’s a fabulous style. You have elevated gaudy to a higher level. Keep on blogging for you, but (as I’m sure you can tell from the way your comments just exploded) know that your fans are legion. And that dress? Such a beautiful print! Burda should be so lucky to have you on the cover. Well sweetheart, you must be doing SOMETHING right, because you have oodles of adoring followers, and I always have to scroll down for five minutes to get to the very bottom of the page so i can make a comment – maybe that’s the reason you get ‘likes’ from some people instead of comments – they are in a hurry and don’t want their coffee to get cold! LOL. 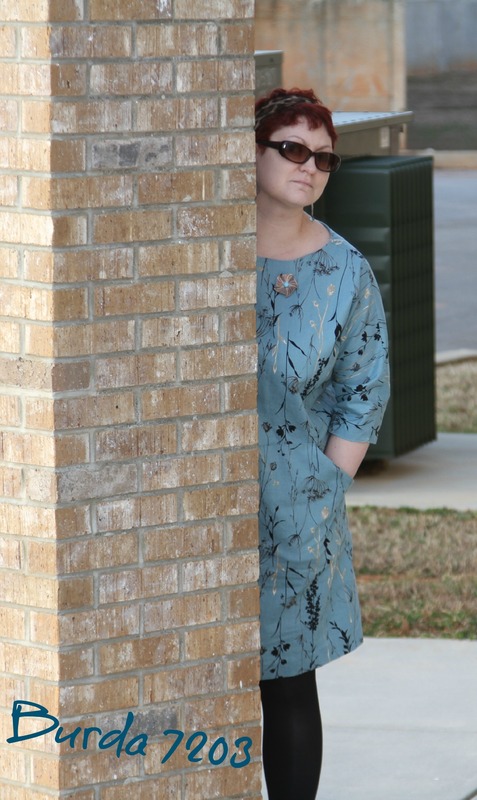 As for the dress, I have to say, this is one of my favourite fabrics I’ve seen you use, and the dress looks so cute and comfy – it’s a total winner, 100%!! I’m hideously behind in my reading and I can tell from the unread count that you haven’t quit, but please don’t quit! You are the poster child of wit, the epitome of wearing what you love, the paragon of personal style. I love love love reading your blog: you have one of the best, funniest, most delightful writing styles and I honestly love what you make and wear. I try to comment as much as I can but sometimes I can’t think of anything witty and entertaining enough to share, and squeaking “that’s pretty!” again seems inadequate. Oh, and the blue dress is, of course, fabulous! Oh you! You really know how to start my tuesday- words to live by. Thank you!